The Wurlitzer Theatre Organ, built in 1928 by the Wurlitzer Company of New York was installed in the State Theatre, Flinders Street Melbourne in 1929. The organ was removed in 1963 and installed in its present location in 1970 after restoration by members of the Theatre Organ Society of Australia. The organ is particularly associated with silent cinema, a major form of popular entertainment introduced in the early twentieth century. The Wurlitzer organ has twenty-one ranks and is able to exhibit a richness and diversity of sounds beyond the capabilities of earlier more traditional nineteenth century pipe organs. The Wurlitzer Theatre Organ is of historical and technological significance. The Moorabbin Town Hall Wurlitzer organ is historically significant as the only example surviving in Victoria. It is historically significant for its association with popular entertainment, particularly the development of the cinema in Victoria. The State Theatre, where the organ was originally located, was one of only three American-inspired "atmospheric" cinemas in Australia. The Wurlitzer contributed to the ambience of this theatre during its silent film phase. 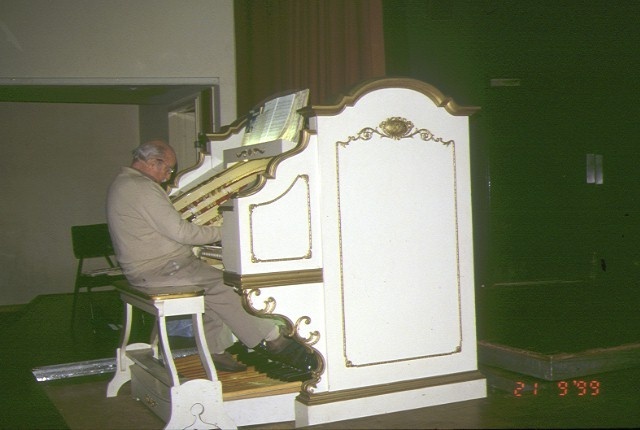 Since relocation to the Moorabbin Town Hall, the Wurlitzer has continued to entertain and offer evidence of the "atmospheric" cinema experience. The Moorabbin Town Hall Wurlitzer organ is scientifically important for its ability to illustrate technological advances in the construction of organs, which in the nineteenth century were primarily used for sacred music. Following the application of electricity organs became more flexible resulting in the freeing of the console from the pipe chest, allowing the organ console to be located at a distance from the pipe chest, joined only by its electric cable. 1. All the structure known as the Moorabbin Town Hall Wurlitzer Theatre Organ including the console; the relays and relay room; all the pipes; and ancillary and connecting elements such as wind pumps. Concert-hall organs, as opposed to church organs, were a nineteenth century development. The concert-hall organ was a further development of the twentieth century and occurred as a result of the introduction of 'moving pictures' or the cinema. Initially theatre and cinema organs were much the same as church or concert-hall instruments. However, a different and distinct style of design and construction soon emerged. Developed during the early 1900s the 'Wurlitzer' was designed to provide the musical accompaniment for silent films. Prior to the late 1920s no technology existed to satisfactorily record a film sound track, and early cinemas tended to follow the same pattern as traditional music halls providing stage acts and musicians as well as a silent film show. Until films had soundtracks, there was a need for some form of accompaniment to complement the silent motion pictures which were shown in cinemas. Initially picture theatres employed piano players to accompany films - a role which required considerable talent for rapid improvisation as scenes changed. What was needed was an instrument with a full range of orchestral sounds including percussion and sound effects able to play popular music at sufficient volumes for large auditoriums. The organ, as a one-man band, was the ideal instrument to provide such accompaniment. With electric action, the pipes could be fitted in anywhere around the auditorium. It had a wide range of sounds and tone colours and an endless range of special affects, from bird whistles to thunder pedals and from fog-horns to church bells, all of which could be used to enhance the drama of the film. An eccentric English inventor Robert Hope-Jones (1859-1914) solved the problem. Often dubbed the father of the theatre organ, Hope-Jones was born in Cheshire England late last century. Although displaying a musical interest early in life as an organist and chorister, at the age of seventeen he was apprenticed to a large engineering and shipbuilding firm. Later, experiments with foghorns and compressed air produced the 'Diaphone' which when adapted to pipe organs produced substantially stronger bass notes. Newly acquired engineering skills, and a particular interest in the application of electricity, led to his appointment as chief electrician of the Lancashire and Cheshire Telephone Company. Further inventions followed but perhaps the most impressive and controversial was his electric organ action. Prior to this organ consoles were connected to their pipe chests either mechanically through a series of wooden trackers or pneumatically through a forest of small tubes. Now for the first time the organ console could be moved about the building connected only by its electrical cable. Unfortunately like many inventors Hope-Jones was not a business man. A perfectionist at heart his unwillingness to compromise caused serious arguments and disagreements. After emigrating to America a promising association with the Rudolph Wurlitzer Company of North Tonawanda, New York failed. In 1914 Hope-Jones committed suicide and his organ patents were ultimately acquired by Wurlitzer. This was the era of the motion picture palace, and Wurlitzer quickly became the largest single manufacturer of theatre pipe organs in the world. Once 'talking' films arrived, the cinema organ lost its popularity and in the 1950s and 1960s many instruments were removed from their original homes and often scrapped altogether. The Model 270 Wurlitzer organ, now located in the Moorabbin Town Hall in the City of Kingston, was originally installed in the State Theatre Melbourne. It is significant that only four examples of this model are known to have been made and, of these, three came to Australia. Two identical twin console organs were purchased for the State Theatre in Melbourne and Sydney. Another, without the second console and 32' Diaphone extension, was installed in the Regent Theatre Melbourne. The fourth with a slightly different specification was destined for England and the Trocadero Cinema, Elephant and Castle near London. Of the three Model 720s to come to Australia only Kingston's Moorabbin Town Hall organ remains in playing condition today. The Regent Melbourne organ was totally destroyed by fire in 1946 and the State Theatre Sydney organ has suffered substantial water damage which requires extensive rebuilding. Built in 1928 Kingston's Wurlitzer was ordered by Union Theatres for their new State Theatre then under construction on the corner of Flinders and Russell Streets Melbourne. With its Moorish exterior complete with tower and minarets, the State was the largest picture palace built in Australia. The State Theatre opened on the 23 February 1929 with a silent film presentation. To provide the musical accompaniment the theatre advertised a thirty-piece orchestra along with "The Mighty Wurlitzer - the largest Wurlitzer organ to leave America and the greatest instrument of its kind in Australia." Reportedly costing over £25,000 the organ consisted of twenty-one ranks or sets of pipes each with a different tonal characteristics, along with various percussions, effects and a matching grand piano. It was played from two separate four manual consoles on either side of the proscenium. The main console rose on a lift at stage left while the 'slave' console was permanently positioned at the right side of the stage. The opening performance was played on the organ by American Frank Lanterman who had been brought out specially for the opening season. With four sessions a day the theatre soon required another organist and Melbourne musician Arnold Coleman was engaged for the intermediate session. Following Lanterman's return to America Coleman became house organist, a position he retained form 1929 until 1940. With the advent of television in 1956 dwindling theatre attendances cast a shadow over the viability of massive picture palaces like the State. The organ remained in use for only another twelve months. Over the next few years apart from some religious services on Sundays the organ remained unused. This was also the case at the State Theatre in Sydney where regular use of the organ (the identical twin of the Melbourne State) was discontinued. In 1962 the second console of the organ was sold privately. Not long after the high pressure water mains servicing the hydraulic lifts for the main console and orchestra pit were permanently disconnected. By 1963 Greater Union Theatres had announced that the State would be converted into two new cinemas - the Forum and the Rapallo. During this process the stage was completely re-carpeted entombing the main organ console in its pit. Later that year an advertisement appeared in the tenders columns of the Melbourne papers for the sale of the organ. It was purchased by Gordon Hamilton a local organist and member of the newly formed Theatre Organ Society of Australia, Victorian Division. Not without some difficulty the organ was removed and placed in storage where it remained for the next five years. By 1968 Gordon Hamilton, perhaps realising the enormity of the task of restoring and housing the organ, indicated his willingness to sell the instrument if a suitable buyer could be found. Negotiations between the City of Moorabbin and the Theatre Organ Society of Australia Vic. Division resulted in the Council purchasing the organ - the Society providing free labour for its restoration and installation in Moorabbin Town hall. The opening concerts to capacity houses were performed by American organist Lyn Larsen in May 1970. In 1972 a Post Horn rank was added and the organ has remained unchanged since that time. The organ has been regularly played and recorded by both international and local organists. Apart from concerts the 'Mighty Wurlitzer' is often featured at a variety of functions such as Citizenship Ceremonies, Australia Day celebrations, Mayoral balls and other civic events. In 1992 the National Trust of Australia (Victoria) included the organ on its register. Remaining substantially intact, this instrument is described as a priceless community asset of national importance and recognised as the largest surviving theatre organ in the country. The Wurlitzer organ is considered to demonstrate 1920s 'state of the art' electrical technology in its switching and relay mechanisms, which are original. The Wurlitzer Theatre Organ is of historical importance in its ability to demonstrate an important era of cinema development, the 1920s boom period of cinema prior to the introduction of 'talkie' movies. The Wurlitzer Theatre Organ is the only one of its type surviving in Victoria, and is a rare example able to demonstrate technological advances in the construction of organs. The Wurlitzer organ is able to illustrate technological advances in the construction of organs which, in the nineteenth century, were primarily used for sacred music. The Wurlitzer was technologically advanced and more adaptable following the application of electricity which allowed flexibility by freeing the console from the pipe chest and only requiring connection to the electric cable. The Wurlitzer Theatre Organ which was initally installed in the State Theatre, was built on the most lavish scale from the best of materials and is the largest remaining Wurlitzer organ exported to Victoria in the 1920s and remains in a largely original condition. The Wurlitzer organ has twenty-one ranks and is able to exhibit a richness and diversity of sounds beyond the capabilities of earlier more traditional nineteenth century pipe organs. The Wurlitzer organ is important in its ability to demonstrate technological advances in the development of organs through the application of electricity. * Minor repairs and maintenance that replace like with like. The importance of the organ lies in its rarity value. No major works should be undertaken without carefully considered, expert professional advice. Day to day maintenance to keep the instrument in operating condition should be allowed without a permit.